Wood glue, ideally quick drying with a fine nozzle on the bottle. 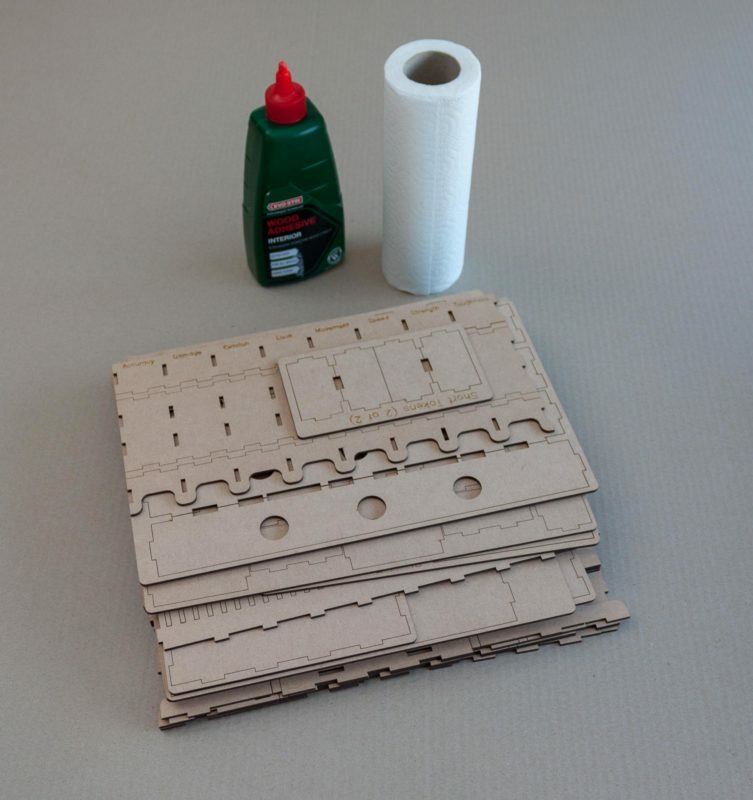 Paper towl, for cleaning up excess glue. Old card/newspaper, to protect your work surface from glue. Elastic bands (optional), for holding tray together whilst glue dries. 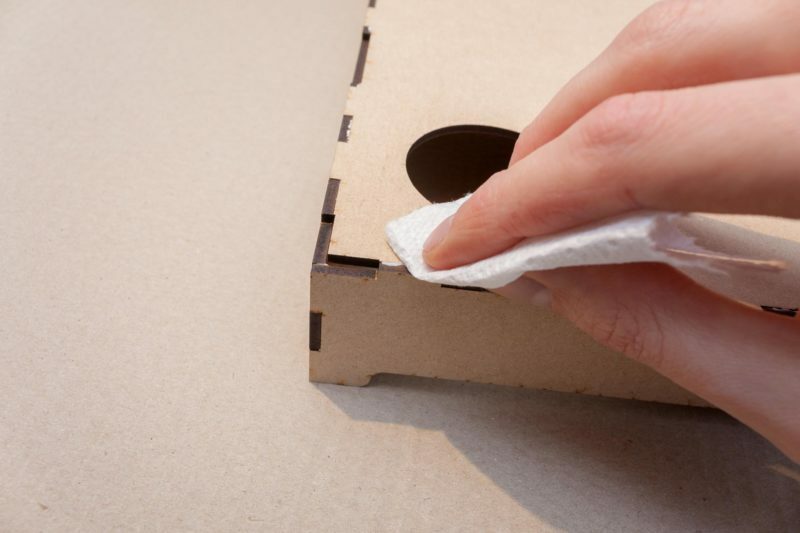 Sandpaper (optional), for cleaning up marks on boxes. 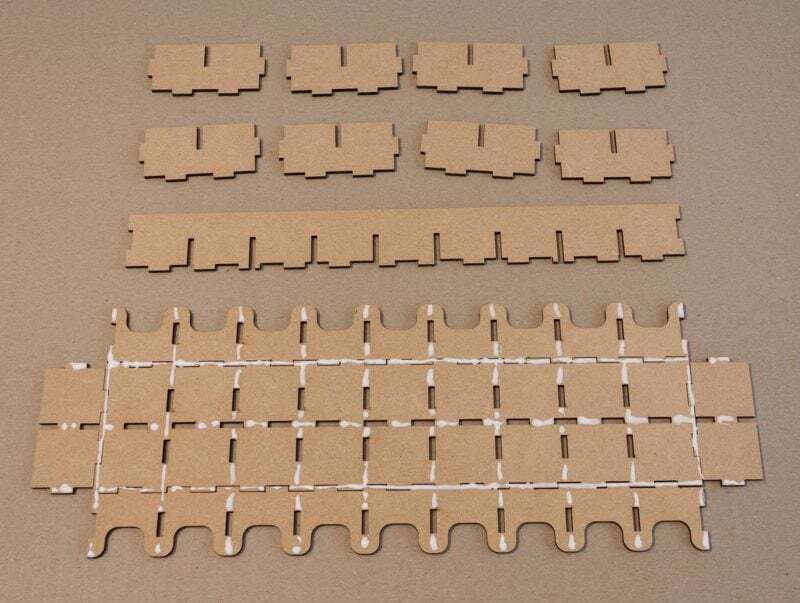 Each tray is delivered as one or more wooden punch out boards. 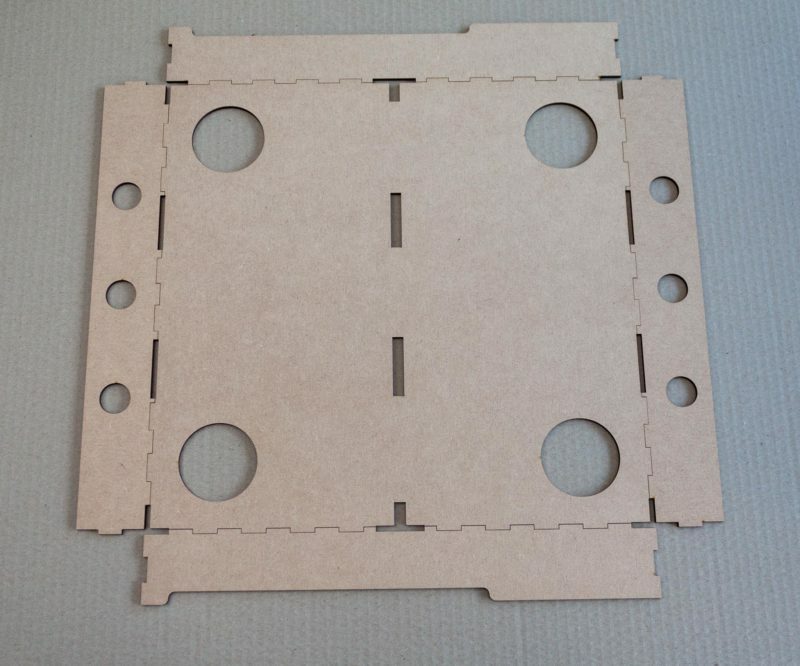 The rear of the boards will have burn marks from the cutting process, that optionally can be removed with sandpaper, this is optional, and has not been done on the pictures shown on the product page. To punch out the components, work carefully round the edges of each part, gently pushing them apart when you find them joined. 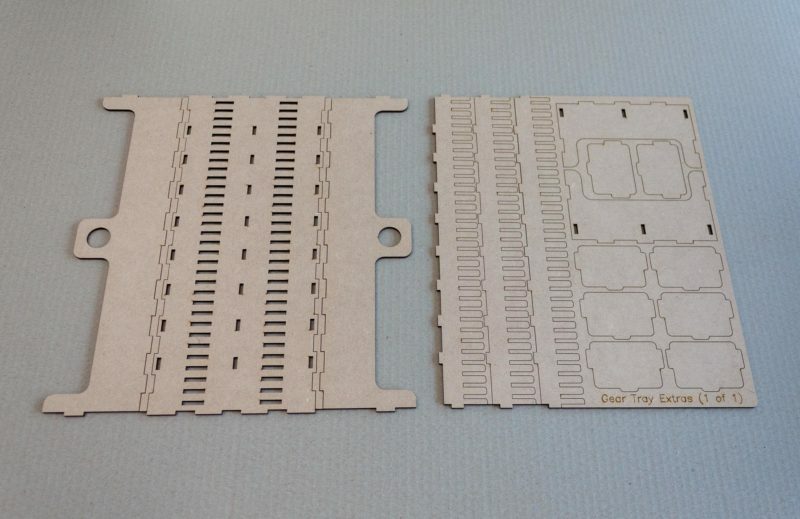 The majority of trays in the insert are assembled by following exactly the same steps. With this in mind, we will cover one tray completely, and then describe and relevant differences for specific trays. 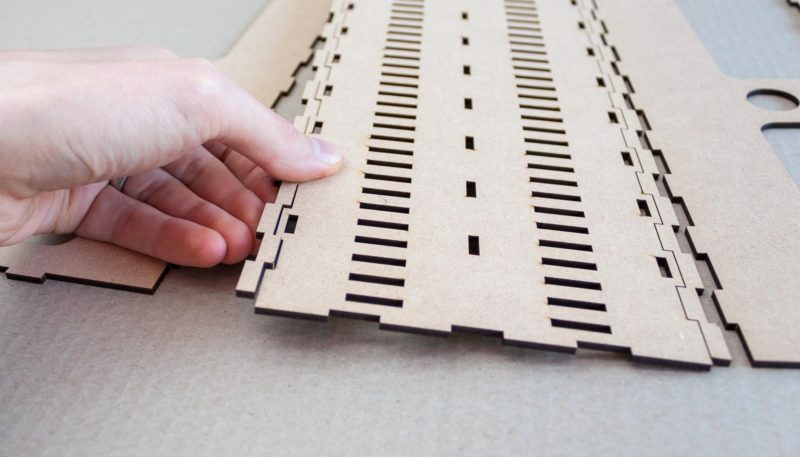 Note: Run through the assembly of each tray without glue first, to ensure that all of the pieces have been correctly identified and located. 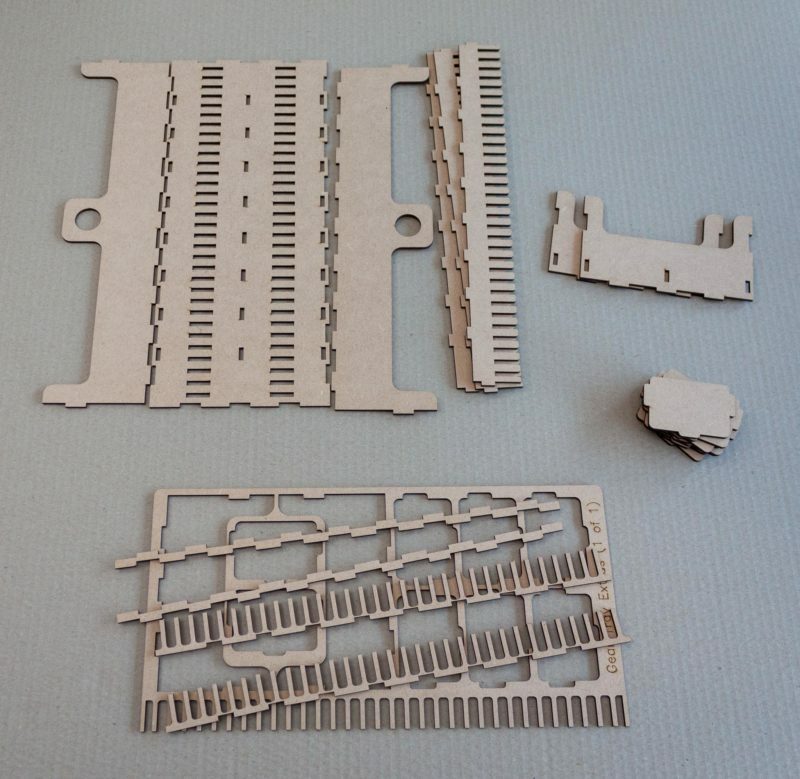 Identify the pieces required for the tray, shown in the picture. Once broken out, arrange pieces as shown. Take care that the top and bottom pieces are both the same way round, such that the indents for the hunt track line up. 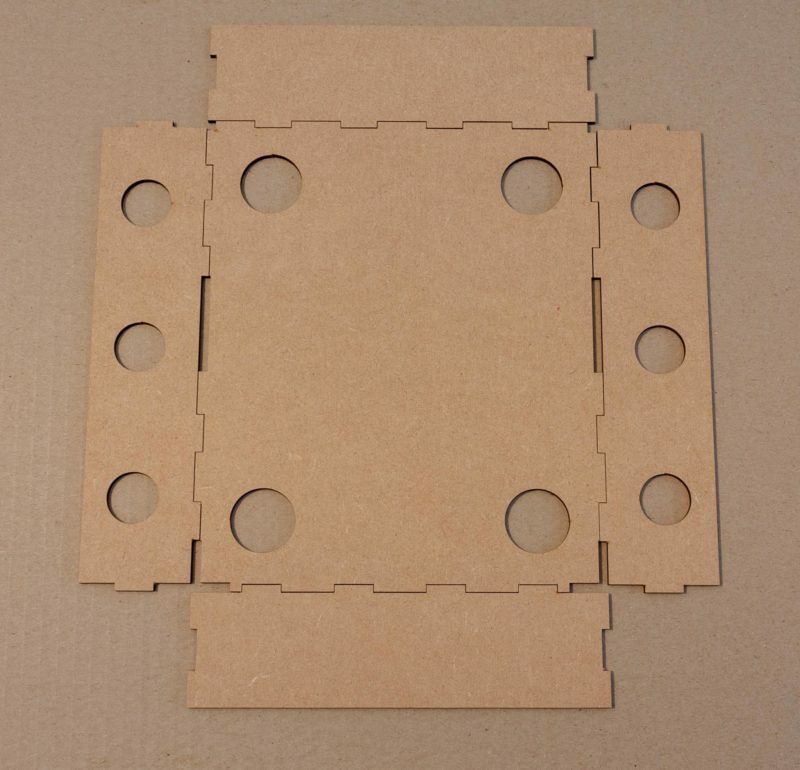 Also check the side pieces align as shown with the holes matching. 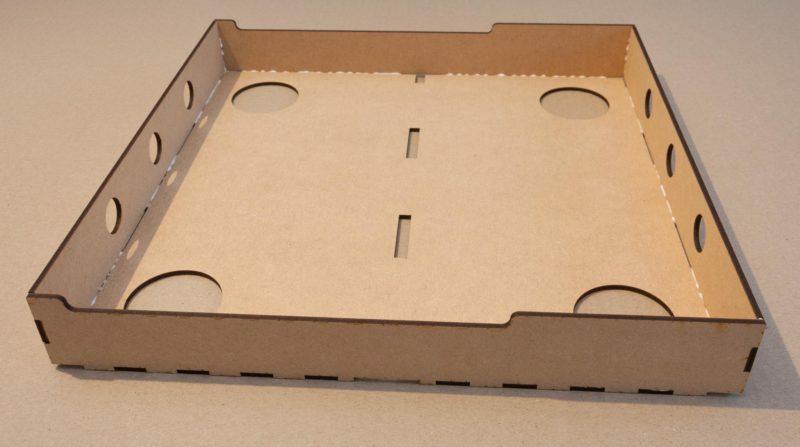 Most trays are symmetrical and can be assembled with the burn marks on either the inside or outside of the tray. Where this is not the case will be identified on specific trays. Apply glue along the seams. 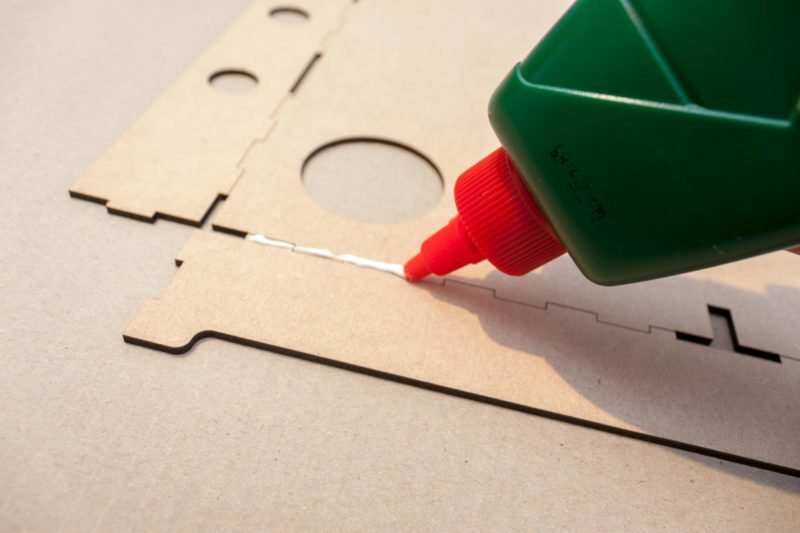 Too much glue, that requires cleaning up, is much better than too little glue, which falls apart after minimal use. 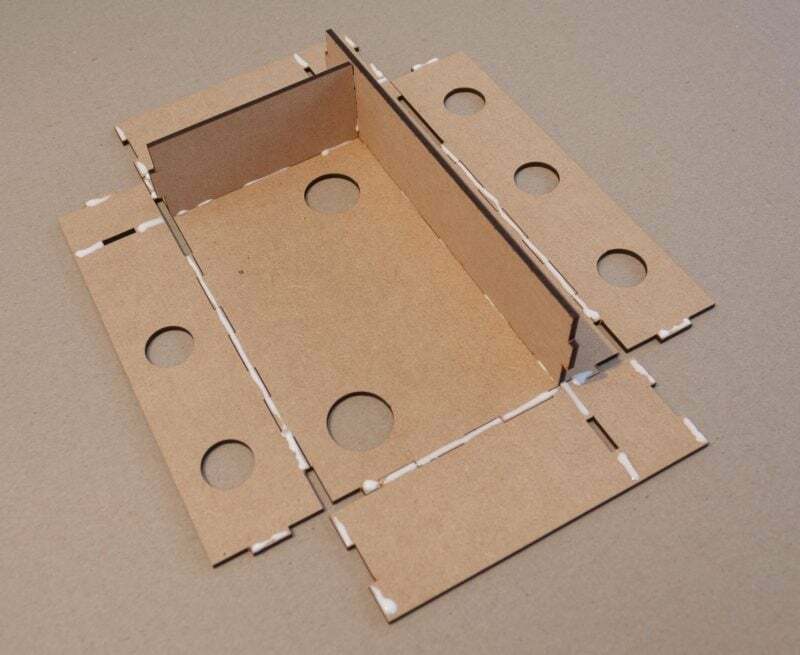 Use this picture to apply glue in all of the required places, try not to miss the pieces making up the corners! 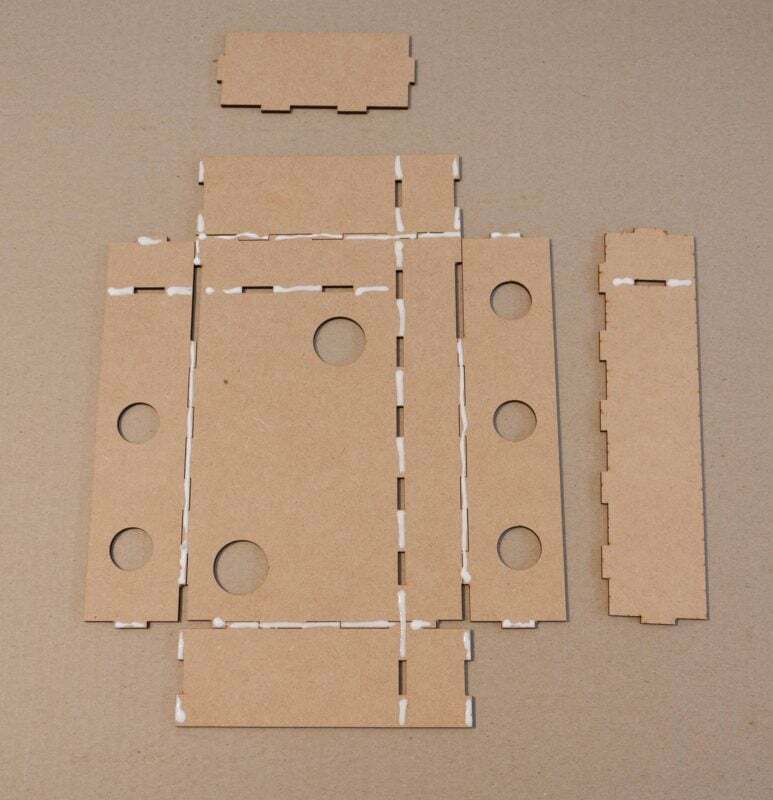 Fold up the edges, and slot the pieces together. Work around the outside of the tray, squeezing the joints together and wiping excess glue away with the paper towel. 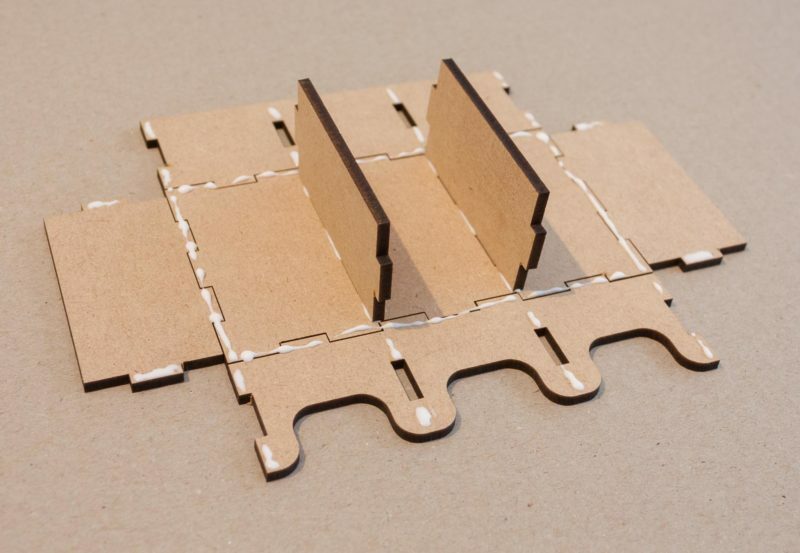 Once squeezed together a couple of times, the pieces should stay together on their own whilst the glue dries. 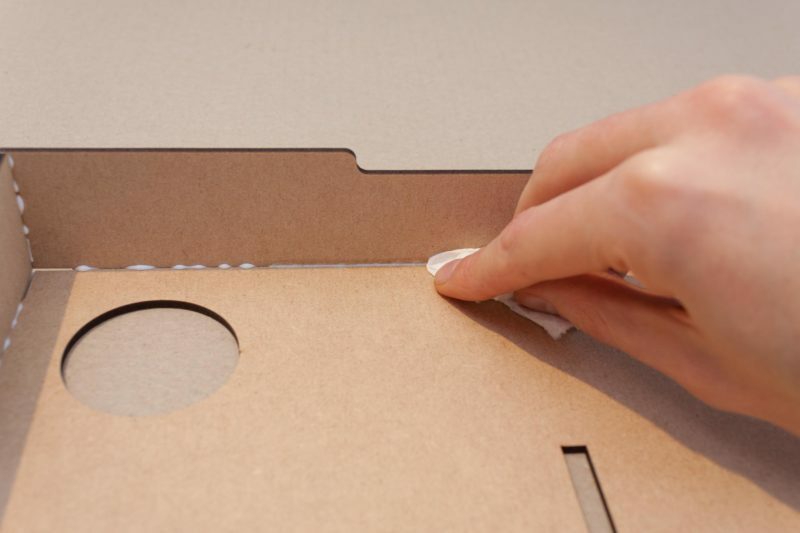 Wipe away glue from the inside of the tray. Complete. 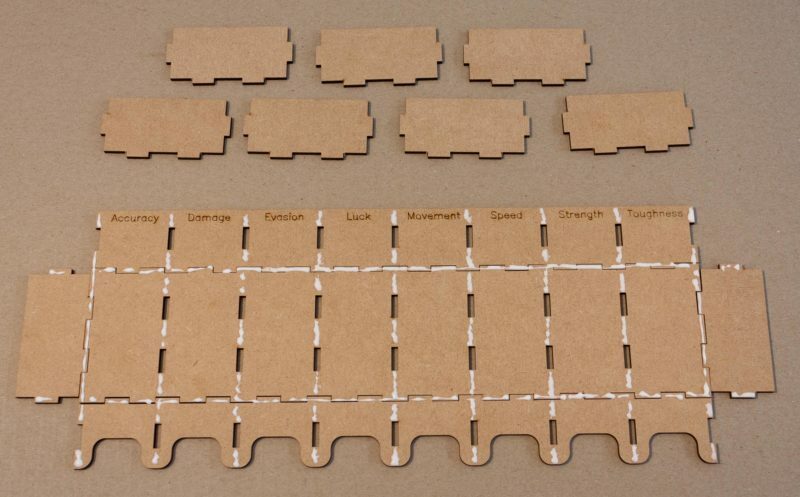 Leave the tray for the glue to dry thoroughly before loading game content in. Layout pieces for glue like such. Pay attention to the left and right side pieces and that they match the picture below, if not, they need flipping/rotating/swapping until they do. This tray is not symmetrical. 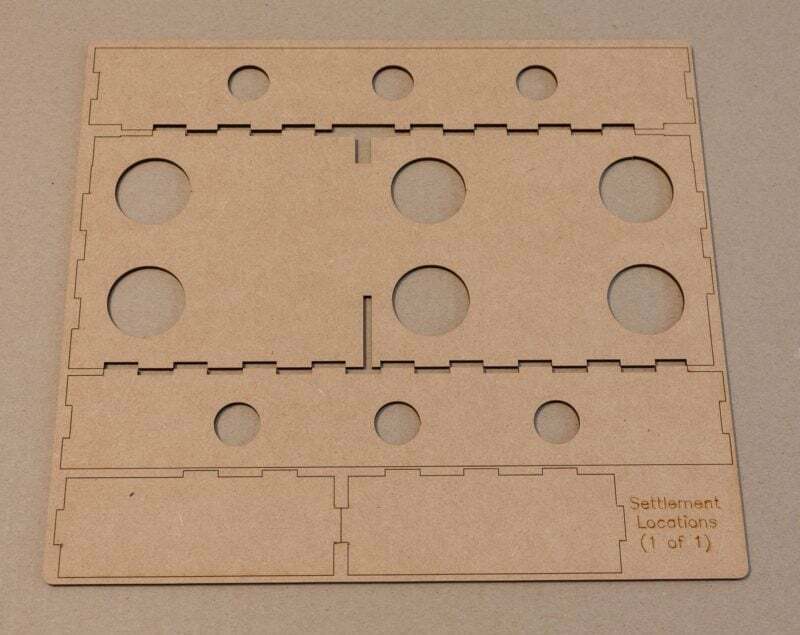 Depending on whether you build it with burn marks on the inside or outside will affect the orientation and locations of trays in the final layout of the insert. 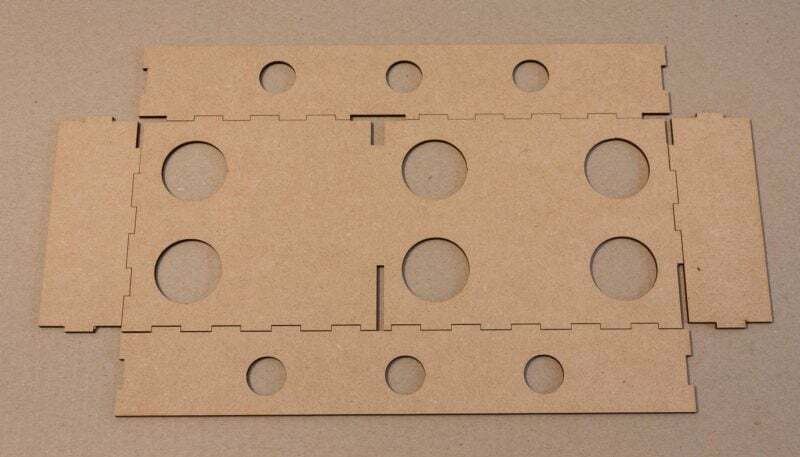 Identify the below punch board. 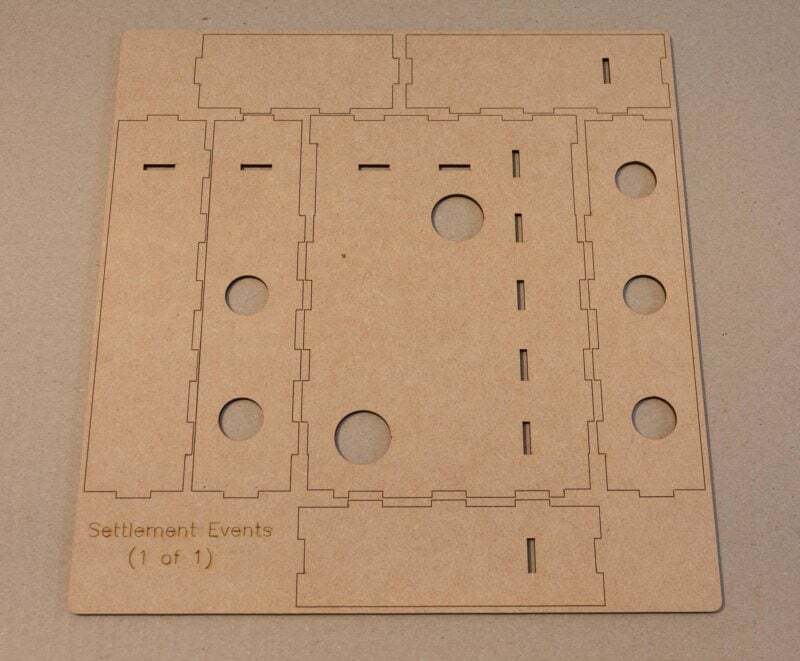 Identify the settlement event tray puch board shown. 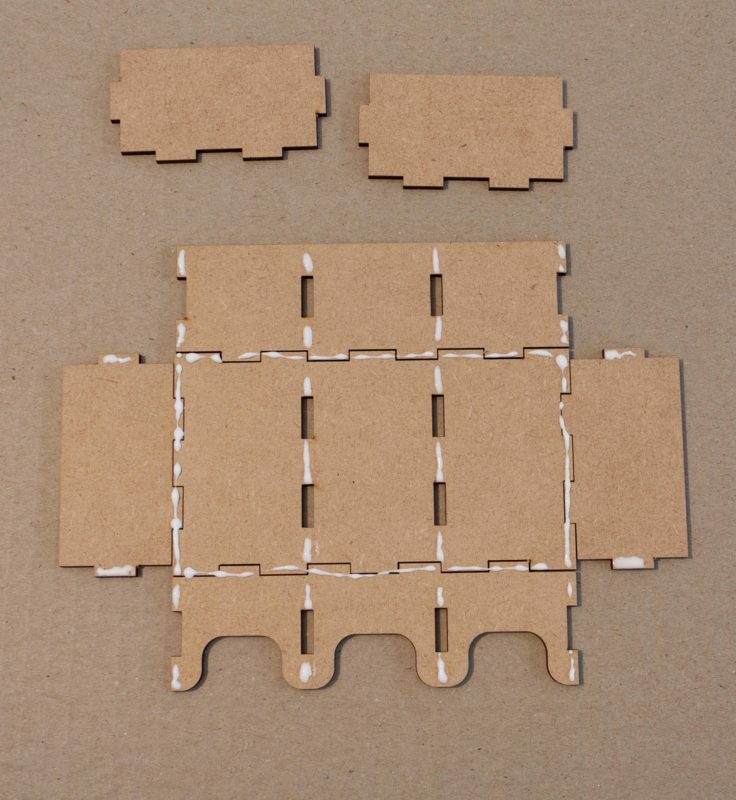 Layout and apply glue to the pieces as shown. Note the locations of the slots that hold up the center dividers. Mate the two center pieces together, then install them into the bottom of the tray. Fold the remaining sides up and complete as normal. 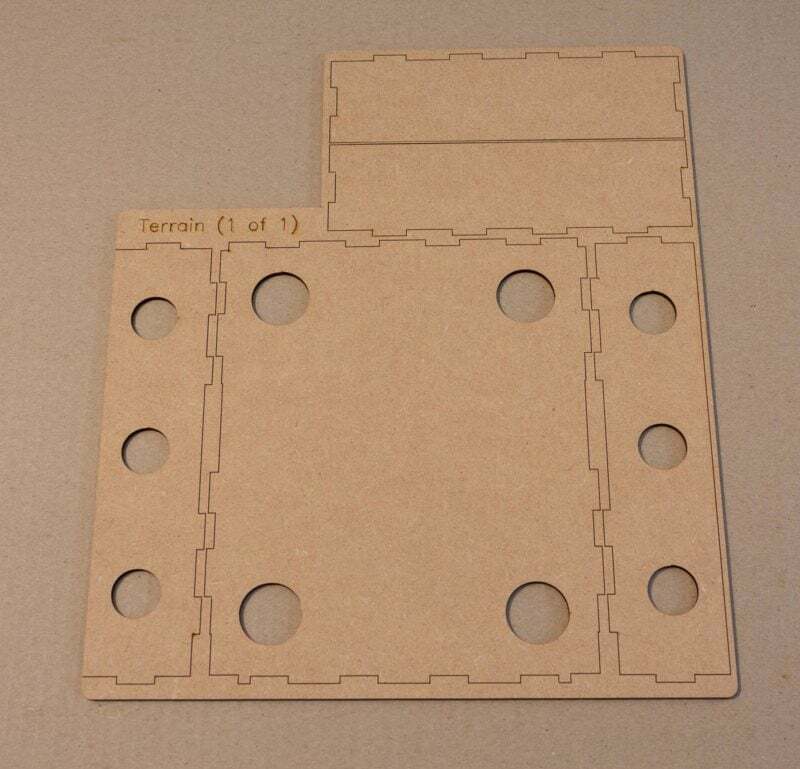 Layout and glue pieces as shown. Note that the dividers and ends are identical, so it does not matter which ones you use. Glue up as shown below. 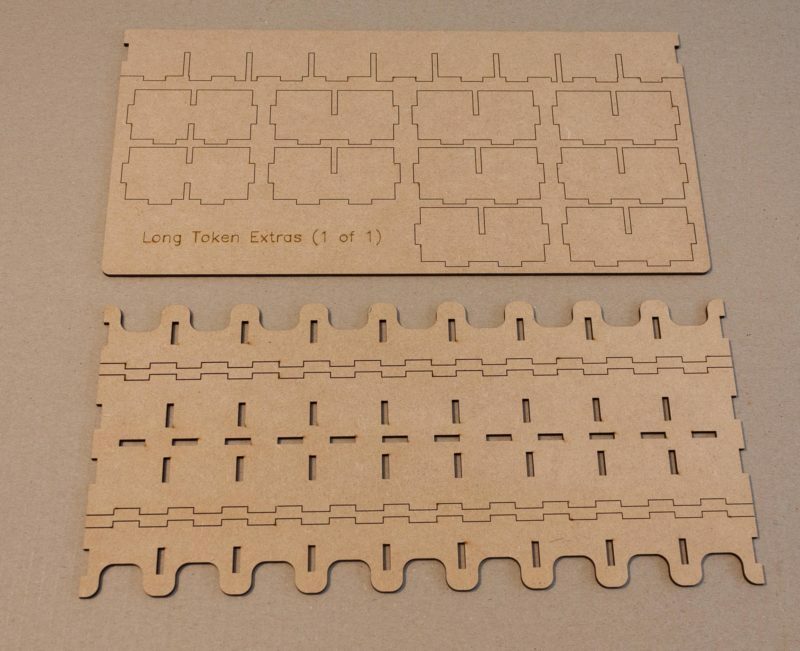 Assemble in the same manner as the short token tray, i.e. central dividers first, followed by the outside pieces. Lay out and apply glue as shown below. 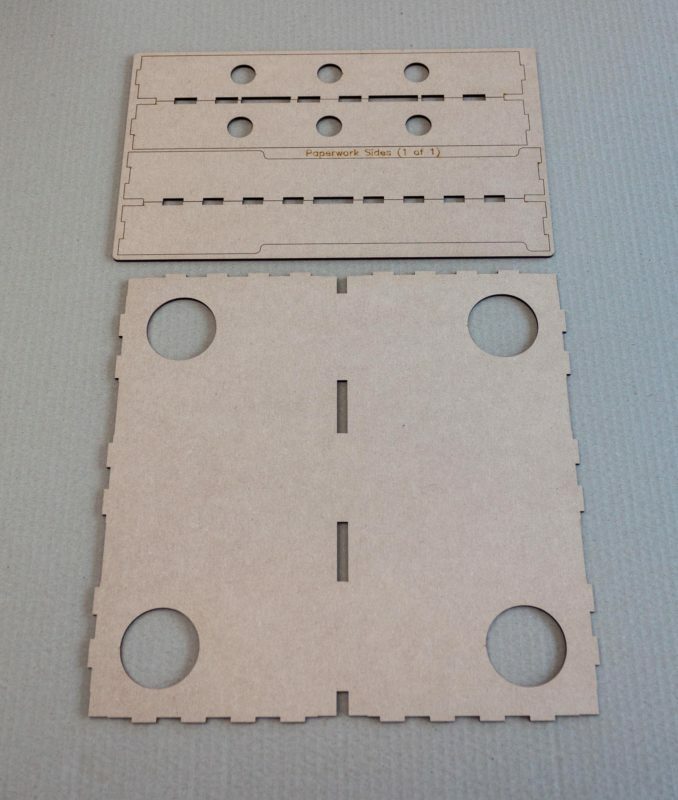 Note that the end pieces have two slots in them, whilst the dividers only have a single slot. 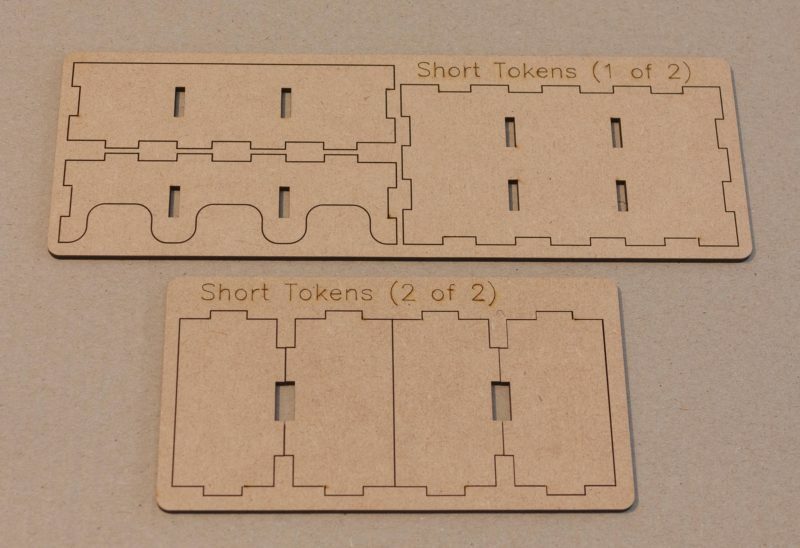 Fit the short dividers into their slots. Then insert the centre divider. 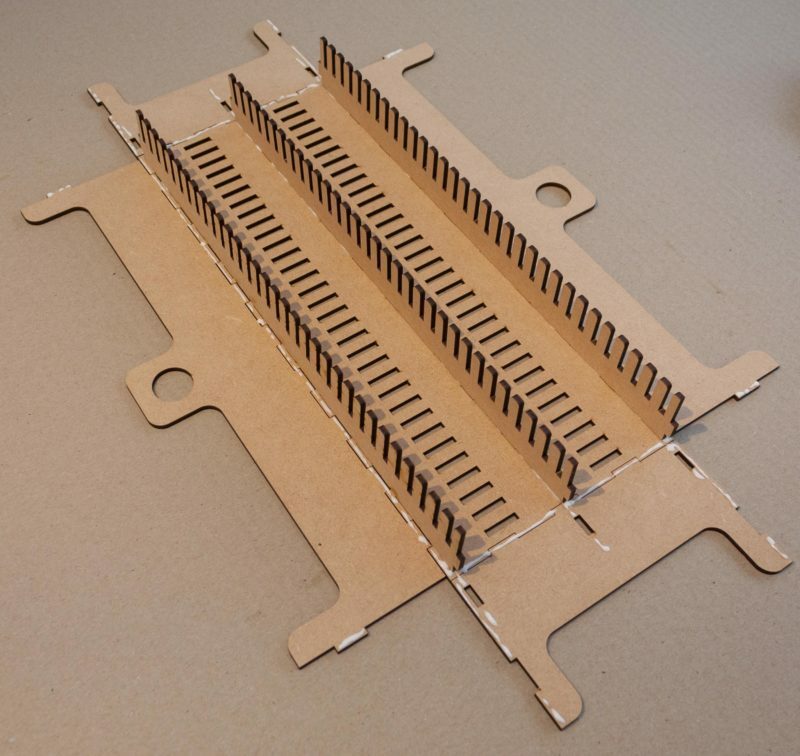 This will require lining each small divider up, and sliding the central piece down from one end to the other. Finally fold up the rest of the sides, and complete the tray as normal. 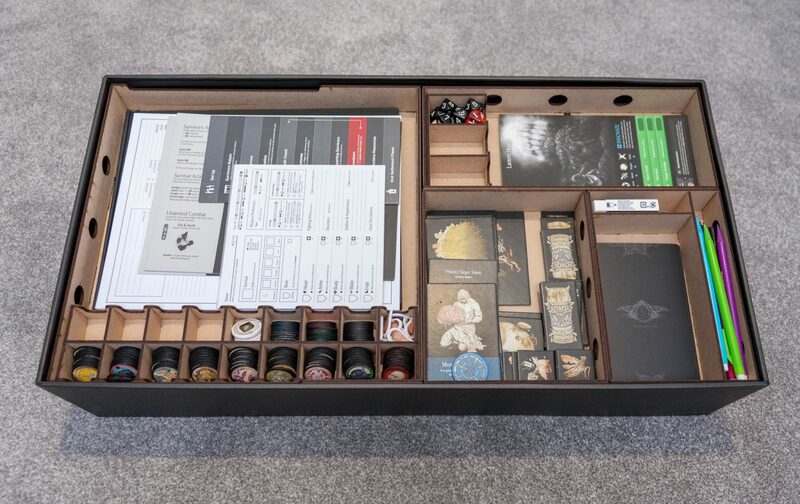 There are four trays for cards included with the insert. 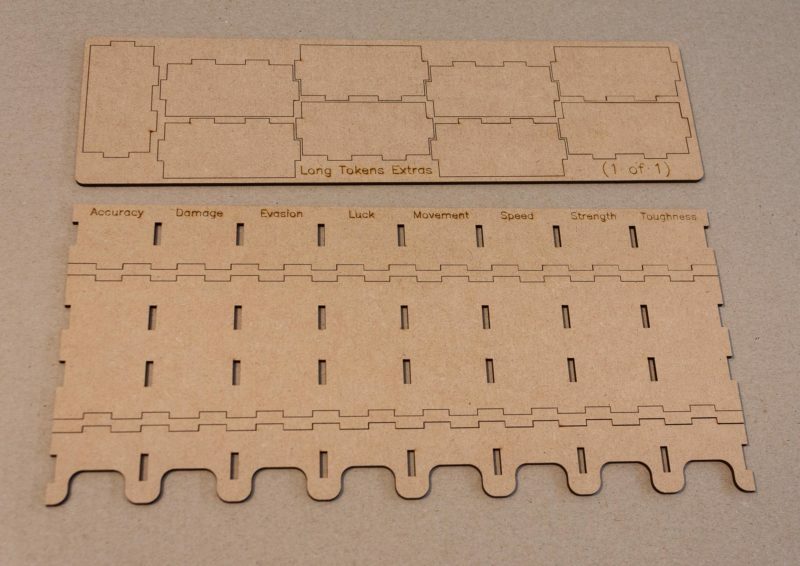 Three regular sized trays for the monster cards, and then either a tray for gear cards (if you chose Option A), or another slightly smaller monster cards tray (if you chose Option B). 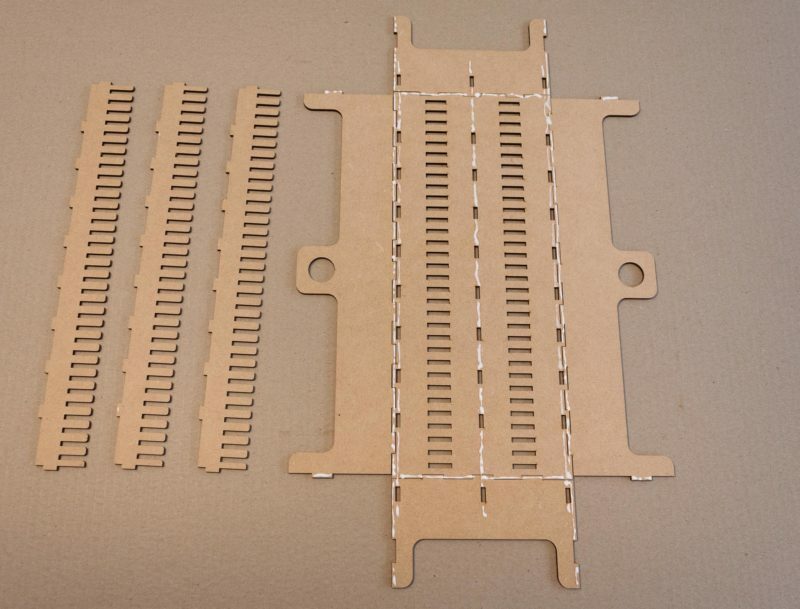 The assembly is similar for all trays. Apply glue as shown. 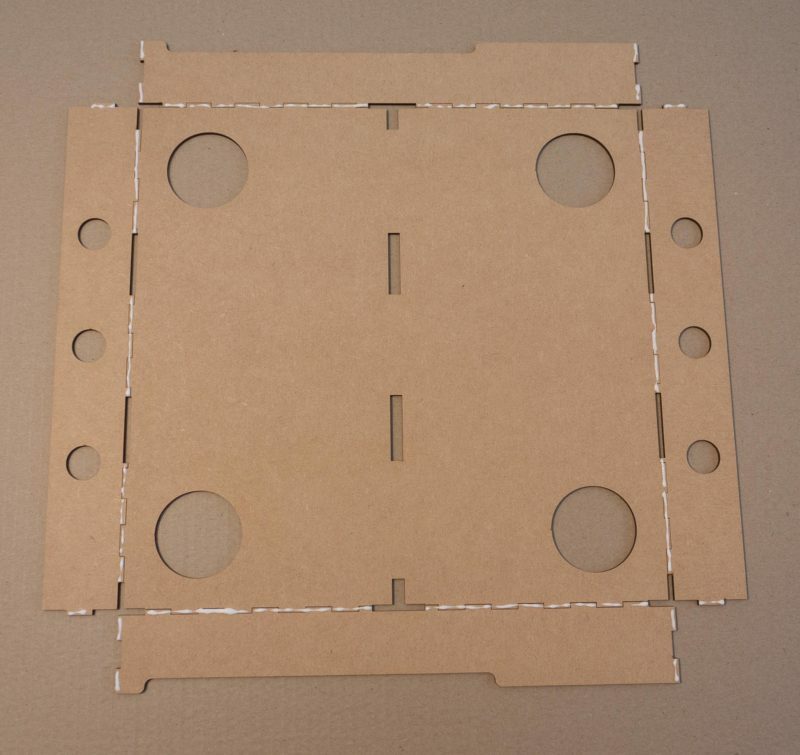 Note that down the sides, there are two lines of glue, one along the seam to hold the box together, and another right next to it which will hold the toothed guide. Insert the toothed guide rails. Finally fold the sides up, and tidy up glue as per all other trays.